U.S. Added 156,000 Jobs In December; Hourly Wages Rose 10 Cents : The Two-Way Over the course of 2016, average hourly earnings rose 2.9 percent, the Bureau of Labor Statistics says. The unemployment rate was little changed: 4.7 percent, compared to 4.6 percent in November. 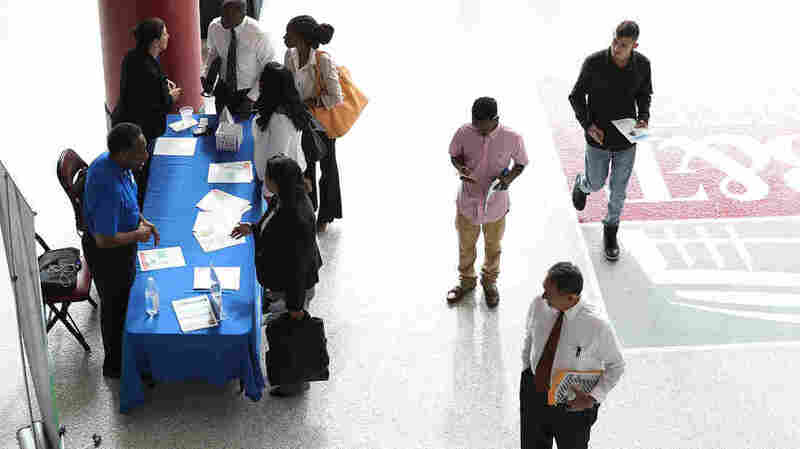 People attend the JobNewsUSA job fair at the BB&T Center on Nov. 15 in Sunrise, Fla. The U.S. added 156,000 jobs last month and hourly wages rose by 10 cents, according to the monthly jobs report from the Bureau of Labor Statistics. The unemployment rate was little changed; it ticked up slightly to 4.7 percent, compared to November's 4.6 percent. Economists had been watching closely to see if the jobs report reflected a rise in wages. The 10-cent increase pushed average hourly earnings to $26; in November, they had dipped slightly, by 2 cents. Over the course of the year as a whole, average hourly earnings rose 2.9 percent, the BLS says. The labor force participation rate changed little, both in December and over the course of the year as a whole. In addition to the 156,000 new jobs in December, job growth in November was revised up significantly — to 204,000 from 178,000. The October report was revised downward, to 135,000 from 142,000, but the overall change for the two months was still positive: 19,000 more jobs than previously reported. For the year overall, the U.S. added 2.2 million jobs — an average of 183,333 jobs per month. "Job growth last year slowed from its pace in 2015, when growth averaged nearly 230,000 [per month]," NPR's Yuki Noguchi tells our Newscast unit. "Part of the drop-off in hiring is coming from smaller firms, which hired the majority of workers during the economic recovery. Partly it is also that producers of goods — manufacturers and miners — have seen a continued contraction in their industries." Manufacturing jobs actually edged up slightly in December, their first increase in months, but remained down by 63,000 compared to last January. The industries that saw noteworthy job gains in 2016 include the health care sector, social assistance, professional services and food services. Friday's jobs report was the last report of Barack Obama's presidency. That has put some economists in a reflective mood, looking back on the first report under Obama. On Twitter, FiveThirtyEight's Ben Casselman notes that the February 2009 report showed 598,000 jobs lost in a month — which was later revised to 791,000. With the latest jobs report, the U.S. has now seen 75 straight months of job growth, which The Washington Post reports is the most extended streak of job growth since 1939.